Successful traders need rules to protect losses and realize gains, and countless published lists of trading rules suggest traders should exit their positions before a company reports earnings. This is primarily because these traders don’t want the risk associated with earnings releases. 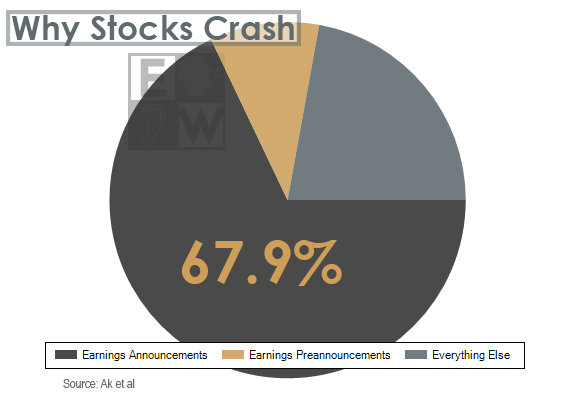 For example, a research paper by B. Korcan Ak and Richard Sloan at the University of California, Berkeley, along with Steve Rossi and Scott Tracey at RS Investments found that an overwhelming majority of stock crashes occur due to poor earnings results. However, trading is about odds and statistics, and the traders writing these rules ignore one of the oldest documented stock market phenomena – the Earnings Announcement Premium (EAP). Back in 1968, Ray Ball and Philip Brown published documented research identifying the abnormal returns following a company’s earnings release when the results exceeded or missed estimates. Messrs. Ball and Brown termed the phenomenon as the Post-earnings Announcement Drift (PEAD). Since then countless research has been done confirming PEAD still exists and disproving the previous “Random Walk” and “Efficient Market “ theories that new information gets immediately priced into stocks. However, around the same time, William J. Beaver at the University of Chicago (now at Stanford University) published his findings that stocks outperform around their earnings release – thus pricing in a premium to the earnings announcement. While Beaver’s Earnings Announcement Premium doesn’t quite get the attention PEAD does when it comes to research, Andrea Frazzini at the University of Chicago and Owen Lamont at Yale and the National Bureau of Economic Research (NBER), confirmed in 2006 that EAP still exists. Chari, Jagannathan, and Ofer’s “Seasonalities in Security Returns: the Case of Earnings Announcements” found the same in 1988, and a handful of other studies also found that stocks tend to trade higher around their earnings release. In our research, from the start of 2003 through the summer of 2015, current S&P 500 stocks have gained an average of 0.81% during the two weeks around their earnings releases, while averaging 0.28% during the rest of the quarter. In other words, during a time where the S&P 500 index was up approximately 10.8% per year and the equal-weighted S&P 500 index was up 17.9%, the individual S&P 500 stocks averaged a 14.7% annualized return during the 44 weeks outside of their earnings release, but if you had just bought the stocks the week before their earnings release and closed the positions a week after their earnings release, you would have averaged an annualized return of 21.1%. We often say that stock prices go higher before a company’s positive earnings release, gap higher on the news, drift higher following the news, or a combination of the three – but very seldom all three. By using the research first started by Ball and Brown, we can focus on the positive or negative drift after a stock gaps on the earnings news and separately focus on the stocks most likely to see an Earnings Announcement Premium ahead of the earnings release. The idea first came to us right after we launched Earnings Whispers when Mark Bagnoli at the University of Michigan, Messod Daniel Beneish at Indiana University, and Susan Watts at Purdue University published their research paper titled “Whisper Forecasts of Quarterly Earnings per Share” in 1999. In their research, they found investors can “earn economically significant returns a week before an earnings announcement” when whisper forecasts exceed consensus estimates. Basically, they found an even greater premium was placed on companies with expectations of exceeding estimates. Since Bagnoli, Beneish, and Watts’ paper, we’ve collected a lot of expectations around earnings -publishing 85,000 Earnings Whisper ® numbers from 11,500 professional analysts, and we’ve collected 1.5 million sentiment readings from 265,000 individual investors. With this data we’ve learned that not all expectations are the same. For example, a company could be expected to have overall negative data, but still be expected to modestly beat earnings estimates... or could be expected to miss estimates, but raise its forward guidance. When we “score” all of this data, we can weed out those companies with neutral expectations and improve upon the tradable premium leading up to a company’s earnings release. 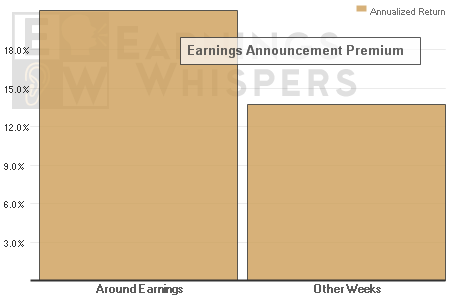 The Earnings Whisper Score ranges from -5 to +5 and this number tells us more about the stock price leading up to the earnings release than the Earnings Whisper number by itself. During the first year of providing the Earnings Whisper Score, current S&P 500 companies have, on average, beaten the consensus earnings estimate by 6.7% and those with an Earnings Whisper Score of +4 or greater have beaten estimates by an average of 12.5%. More importantly though, if you bought them four days before their earnings release and closed them at the open following the news, you would have gained 0.81% - a 51.6% annualized return. Meanwhile, those with an Earnings Whisper Score of -4 or lower missed the consensus earnings estimate by 21.0% and saw their stocks fall during the period by 0.64% while stocks overall rose. The returns were even greater for just the +5/-5 stocks. For stocks overall, including more volatile smaller-cap names, those with an Earnings Whisper Score of +4 or greater have increased by roughly 1.0% during the four days leading up to the companies’ earnings releases and through the opens while those with a score of -4 or lower saw their prices fall more than 0.50% during the four days even though stocks as a whole were up during the period. Just as important, those stocks with a neutral Earnings Whisper Score only increased by 0.10% during the days leading up to earnings and through the open after the news. While the Earnings Whisper Score gives statistical odds for trading both long and short ahead of earnings, another benefit is the implementation of a covered call strategy. Implied volatility around earnings tends to lift option prices and one way to capitalize on the higher premiums is to buy the stock and sell the nearest out-of-the-money call so that if the stock goes higher, it is called away, but if the stock sells off on earnings, the premium sold offsets some of the losses. The risk of this strategy is that the earnings news can be so great that it exceeds the premium captured and you are stuck in a trade without being able to get out. By improving the odds that a stock will go higher ahead of the news, we can improve the success rate of a covered call strategy ahead of earnings. We take this a step farther though by screening through the implied volatility priced into the options and comparing it to the average move each individual stock has recently made when it reports earnings. By finding option prices that are priced for a bigger-than-usual move for a stock that has favorable odds of moving higher, we can capture the move ahead of time while still limiting the losses. This leaves the main downfall to the strategy of leaving upside on the table. 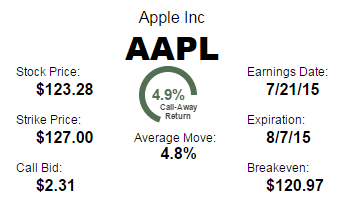 For example, on Friday, July 10, 2015, shares of Apple (AAPL) closed at $123.28 and the $127 call expiring on August 7, 2015 had a bid of $2.31. During the previous couple of years, shares of Apple averaged a 4.8% move on earnings but the options were priced for a 4.9% return. Furthermore, iPhone sales tracked above expectations during the quarter, leading to professional analysts expecting the company to report earnings above estimates when the company releases results on July 21, 2015, which in turn resulted in an Earnings Whisper Score of +5. If the stock moves higher by its typical 4.8% on earnings, then the trader captures the equity move up to $127 and also the premium of $2.31 for a total profit of $6.03. While the Score suggests this is the more likely income, the stock would need to fall below $120.97 before the trade became a loss and, so if it moves by its typical 4.8% taking the stock to $117.36, then the trader risks just 2.9% while still maintaining the opportunity to make the more likely 4.9% move on positive earnings. This is why, our list of +5 Scores also includes a list of favorable covered call trades based on the Score and current option prices. You can also find the Score in our Earnings Whisper Calendar.